UFO-Forschung - What is behind the decline in UFO sightings? This mosaic of Cerealia Facula in Occator Crater is based on images obtained by NASA's Dawn spacecraft in its second extended mission, from an altitude as low as about 21 miles (34 kilometers). As NASA’s Dawn spacecraft prepares to wrap up its groundbreaking 11-year mission, which has included two successful extended missions at Ceres, it will continue to explore -- collecting images and other data. Within a few months, Dawn is expected to run out of a key fuel, hydrazine, which feeds thrusters that control its orientation and keeps it communicating with Earth. When that happens, sometime between August and October, the spacecraft will stop operating, but it will remain in orbit around dwarf planet Ceres. Dawn is the only spacecraft to orbit two deep-space destinations. It has given us new, up-close views of Ceres and Vesta, the largest bodies between Mars and Jupiter. During 14 months in orbit from 2011 to 2012, Dawn studied Vesta from its surface to its core. It then pulled off an unprecedented maneuver by leaving orbit and traveling through the main asteroid belt for more than two years to reach and orbit Ceres, which it has been investigating since 2015. At Ceres, the spacecraft discovered brilliant, salty deposits decorating the dwarf planet like a smattering of diamonds. The science behind these bright spots is even more compelling: they are mainly sodium carbonate and ammonium chloride that somehow made their way to the surface in a slushy brine from within or below the crust. These discoveries were fueled by the tremendous efficiency of ion propulsion. Dawn wasn’t the first spacecraft to use ion propulsion, familiar to science-fiction fans as well as space enthusiasts, but it pushed the limits of this advanced propulsion’s capabilities and stamina. This close-up image of the Vinalia Faculae in Occator Crater was obtained by NASA's Dawn spacecraft in its second extended mission, from an altitude as low as 21 miles (34 kilometers). "Dawn's unique mission to orbit and explore two strange new worlds would have been impossible without ion propulsion," said Marc Rayman of NASA’s Jet Propulsion Laboratory, Pasadena, California, who has served as Dawn's mission director, chief engineer and project manager. "Dawn is truly an interplanetary spaceship, and it has been outstandingly productive as it introduced these fascinating and mysterious worlds to Earth." These days, near the end of Dawn’s second extended mission at Ceres, the spacecraft continues to wow us week after week, with very close photos shot from only 22 miles (35 kilometers) above the dwarf planet -- about three times the altitude of a passenger jet. Although the Dawn mission is winding down, the science is not. Besides the high-resolution images, the spacecraft is collecting gamma ray and neutron spectra, infrared and visible spectra, and gravity data. The observations focus on the area around Occator and Urvara craters, with the main goal of understanding the evolution of Ceres, and testing for possible ongoing geology. The first results of this mission phase, which started in early June, are being presented this week at the Committee on SPAce Research (COSPAR) meeting in Pasadena. Raymond and JPL scientist Jennifer Scully will offer new information on the relationships between bright and dark materials on the floor of Occator Crater, which show impact processes, landslides and cryovolcanism. Dawn scientists are using new high-resolution data from Dawn to test and refine hypotheses about Occator crater’s formation and evolution. “Observations, modeling and laboratory studies helped us conclude that the bright spots are either formed by impacts interacting with the crust, or that a reservoir of briny melt contributed to their formation,” said Scully. The new images so far support the hypothesis that exposure of subsurface material in that region is ongoing, and that it is geologically active, feeding from a deep reservoir. Eleonora Ammannito of the Italian Space Agency, deputy lead for the Dawn visible and infrared mapping spectrometer, will present updated maps at the conference showing the distribution of briny materials across Ceres’ surface. Also at COSPAR, Dawn flight team member Dan Grebow of JPL will describe Dawn’s final orbit, designed to abide by NASA’s planetary protection protocols. Low-altitude images collected by Dawn are posted regularly to the mission’s web page here. The Dawn mission is managed by JPL for NASA's Science Mission Directorate in Washington. Dawn is a project of the directorate's Discovery Program, managed by NASA's Marshall Space Flight Center in Huntsville, Alabama. JPL is responsible for overall Dawn mission science. Orbital ATK Inc., in Dulles, Virginia, designed and built the spacecraft. The German Aerospace Center, Max Planck Institute for Solar System Research, Italian Space Agency and Italian National Astrophysical Institute are international partners on the mission team. What Is 13,000 Feet Tall, Millions of Years Old, and Spews Out Ice? 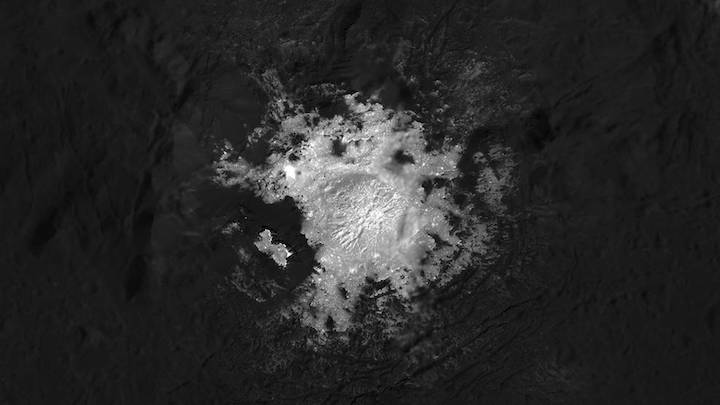 Scientists are searching for a mysterious kind of volcano on the dwarf planet Ceres. Ice volcanoes sound like something out of a Syfy-channel movie, perhaps produced by the same people behind the Sharknado franchise: a muddy mix of ice, rock, and salts erupting through cracks in the terrain and scattering out onto the landscape, freezing everything in its path. But they are in fact a natural phenomenon that scientists believe occurs across our solar system and beyond. For several years now, scientists have been puzzling over one such volcano on the dwarf planet Ceres. Ceres orbits more than 200 million miles from the sun, between Mars and Jupiter, where it reigns as the largest object in the asteroid belt. Ceres is made of rock and ice, and formed alongside the planets in our solar system about 4.5 billion years ago. For years, scientists using computer simulations of conditions on Ceres predicted that the dwarf planet could host ice volcanoes, or cryovolcanoes. In 2007, nasa launched a mission on a years-long journey to explore the asteroid belt. When the spacecraft Dawn arrived at Ceres in 2015, it captured high-resolution photographs of the dwarf planet. They revealed a surface covered in craters. But near the equator, a curiosity: a sole mountain peak, jutting out against the sea of deep impressions in the rocky terrain. For the scientists, the peak, standing about 13,000 feet tall, fit the bill: It was their first ice-volcano discovery on the dwarf planet. They named it Ahuna Mons, and estimated its age was 200 million years—old enough to have ceased erupting, but young enough to suggest it was active in the recent past. It was an exciting find for scientists, who turned to a new question about ice volcanoes on Ceres: Why was there only one? Michael Sori, a scientist at the University of Arizona’s Lunar and Planetary Laboratory, suspected that other ice volcanoes had existed on Ceres but were erased by a natural process over time. In this process, known as viscous relaxation—which sounds more like a new skin-care routine than a geological phenomenon—a blob of a material can collapse under its own weight and ooze outward. “Rocks don’t do that under normal temperatures and timescales, but ice does,” Sori explained in a recent press release. The erupting ice eventually flattens the surrounding terrain. Meteor impacts help out, too, by smashing the peaks. To test this theory, Sori and his colleagues used computer models to simulate the landscape of Ceres over hundreds of millions of years. They inserted ice volcanoes into the terrain and then ran the clock forward. Volcanoes at the dwarf planet’s poles, where it’s colder, remained frozen. Near the equator, where it’s warmer, volcanoes seemed to deflate, becoming shorter and rounder until they flattened out. To bolster their hypothesis, the researchers needed real data, and they turned to Dawn, the nasa spacecraft. Sori and his team used topographic observations from the probe to look for bumps in the terrain that matched their models. They found 22 mountains, including Ahuna Mons, that aligned nicely with their simulation’s predictions. They estimate the landforms are each hundreds of millions of years old, and that Ceres produces a new ice volcano about once every 50 million years. Their results were published earlier this week in Nature Astronomy. 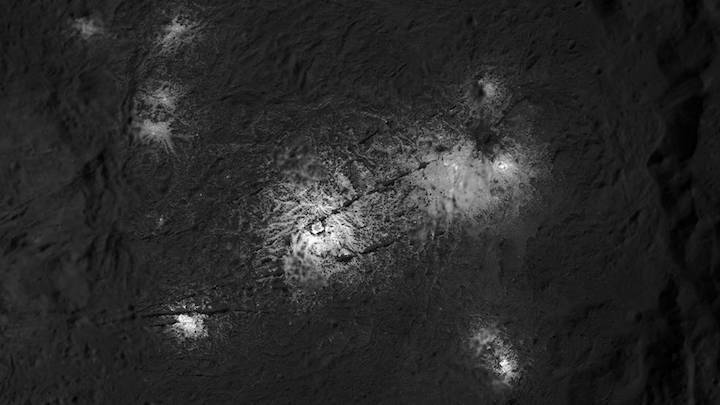 The mechanism that fuels these cryovolcanoes on Ceres remains a mystery. Scientists believe the dwarf planet may have enough primordial heat left over from its formation billions of years ago to churn material beneath its surface. Hanna Sizemore, a scientist at the Planetary Science Institute and one of the study’s authors, says the evidence for cryovolcanoes on Ceres and other ice-bearing bodies in the solar system is piling up. Scientists have previously observed evidence of ice volcanoes on Jupiter’s moon Europa, Saturn’s moons Enceladus and Titan, Neptune’s moon Triton, and even Pluto. In the case of Europa and Enceladus, the observations suggest the moons harbor massive oceans beneath their icy exterior that may be capable of sustaining microbial life.